Analysts agree that more Chief Digital Officers will be hired in 2015 than ever before, continuing the trend predicted by CDO Club founder David Mathison that the number of CDOs would double every year. So many Chief Digital Officers are being hired for a reason—usually to deal with digital disruption. 48% of successful companies relied on hiring specialist digital talent in the wake of a disruption, breach, or hack. Crowdfunding enables peers to fund new projects, businesses, and media, and has raised $16 billion last year–without a single physical banker involved. Welcome to the Collaborative Economy: an economic model where commonly available technologies enable people to get what they need from each other. People are bypassing inefficient corporations to share goods, services, space, and money with each other. Just take a look at the transportation industry to see how deep the level of disruption really is: People are sharing rides via BlaBlaCar, hiring private drivers on Uber, renting from Zipcar, and, soon, they may even be 3D printing their own vehicles. As with almost all digital disruption, incumbent organizations can choose either to fight the trend (and perish) or to hire a Chief Digital Officer to take advantage of it. This is where Jeremiah Owyang comes in. He’s the founder of Crowd Companies and will be a featured speaker at the Chief Digital Officer (CDO) Summit, on April 29, sponsored by Capgemini. Owyang has spent the last few years researching and even living in the Collaborative Economy. At one point he was able to use shared services to such a degree that he purchased fewer than 10 items in a three-month time span (not including food, personal/health care, and business travel). 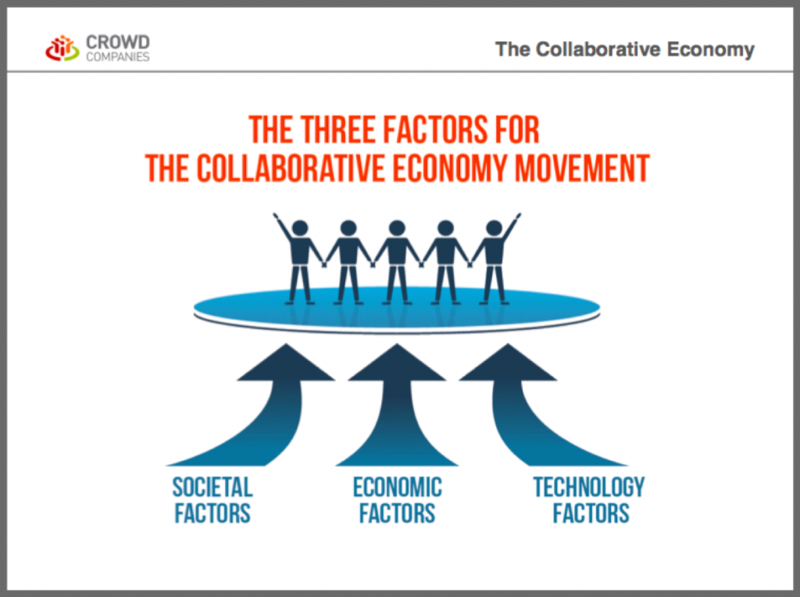 Owyang found over 13 distinct drivers behind the Collaborative Economy. “If these market drivers are long-term (often social and economic drivers are), then this movement is likely to persist and to potentially increase in velocity,” he concluded. Since this is likely a long-term trend, corporations have two options: they can either fight or adapt. Ignoring disruption will likely result in their organizations–and yours–going the way of Blockbuster and newspaper classifieds. Some organizations have chosen to battle this trend with lobbying or marketing. The city of Amsterdam has reacted to Airbnb, a home-sharing service, by cracking down on people renting their homes without hotel permits. Taxis went on strike in London to protest Uber. Owyang believes these efforts are pointless; “it’s hard to stop a movement that’s pinned off the Internet. It’s an unstoppable force!” For example, Uber reported a wave of signups after a London taxi strike left commuters stranded. 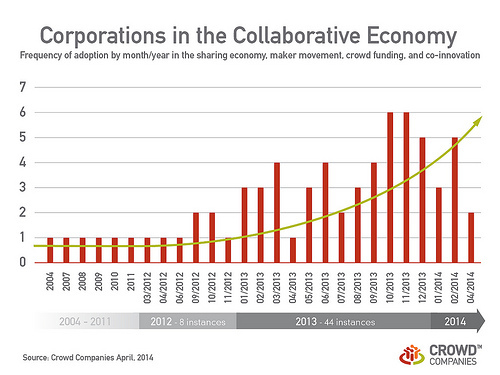 The Collaborative Economy isn’t going away. So how should CDOs respond? Acquire the startups: Just like Avis acquired Zipcar. This can be costly, however, as “investors are in love with the collaborative economy,” Owyang wrote. His analysis of funding activity from January to September last year found a sum total of $2.7 billion invested in the Collaborative Economy in that short period alone. Integrate your business model: Owyang has discovered over 80 traditional businesses that have embraced collaborative practices. Automakers like BMW and Volkswagen now offer car shares. Others simply partner with startups, as GE has done with Quirky. Build your own marketplace: In this final, advanced stage of collaborative transformation, “corporations allow the crowd to collaborate on core business functions, such as design, funding, marketing, development, production, delivery, and sales,” Owyang explains. Kickstarter is a prime example of this. Companies used to purely provide products, then those products eventually became services. But now the most advanced digital adapters build marketplaces and platforms to collaborate directly with their customers. This change is already happening. Nike is allowing customers to design their own shoes. Apple offers refurbished products, bypassing resellers like eBay. Even 110-year-old Dodge allowed its customers to crowdfund the purchasing of a new car with a wedding-like registry. 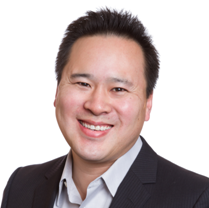 “Corporations that tap a broad, diverse crowd of customers, prospects, and partners for innovation are able to quickly create new ideas, solutions, and products beyond the scope of the more narrowly defined capabilities of a dedicated product team,” Owyang wrote, comparing collaborative organizations to diverse, sustainable ecosystems. 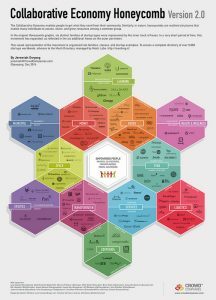 At a session titled “2015: The Year of the Crowd,” presented at the LeWeb conference in Paris, Owyang unveiled a Collaborative Economy Honeycomb graphic containing 12 sectors that have been impacted by P2P commerce. 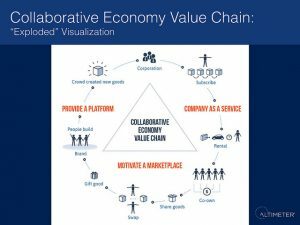 The original graphic only contained six, yet the number of industries and verticals affected by the collaborative economy is certain to grow. The collaborative economy is a long-term trend that Chief Digital Officers and executives ignore at their own peril. This is why the CDO Club is featuring Jeremiah Owyang in the Chief Digital Officer (CDO) Summit on April 29, 2015, at Thomson Reuters in New York City, to discuss the Collaborative Economy and how CDOs should respond. 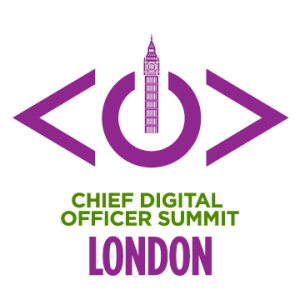 All previous CDO Summits have sold out of attendee tickets, weeks in advance. If you can’t afford to miss this essential discussion, register now at http://nyc.cdosummit.com/register.